- select location - 101 S. New Warrington Rd. Pensacola, Fl 32507 *Drivers under the age of 25 are subject to an additional surcharge. *Weekly rates are also available. *Drivers under the age of 25 are subject to an additional surcharge. to confirm short notice availability. Choose from a category below to view the answers to these frequently asked questions. If your answer doesn’t appear in this section, call us today and a representative will assist you. • What do you have to have to rent a car? • Are You At the Airport? What do I have to have to rent a car? 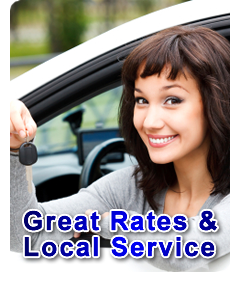 Due to our low overhead, we can charge less than the other national companies on most local rentals. We offer the same vehicle, better personal service, and always try to save you money. We do ask for a major credit card or bank check card in the driver’s name for payment and rental qualification. With a bank check card, we must charge the rent plus a $200 security deposit to the account at time of rental. Refunds will be processed upon return. A local current utility bill and proof of employment that match the renters drivers license address is required. We do charge $100 deposit for a van reservation. Car insurance is very important to us and the safety of our customers. Because of this we do require all drivers to have their own auto liability insurance. If the customer’s insurance is only Liability, we do have collision damage waiver available to cover damage to our car.Drivers 18-20 years of age must have bodily injury liability of $100,000/$200,00 at a minimum, as well as comprehensive and collision coverage which will transfer to a rental vehicle. Please call ahead for same day rental because the type vehicle you may request may not be available on such short notice. We carry a wide selection of new and current model cars, minivans and 15 passenger vans. It is no problem to change or cancel a reservation. Just call. From time to time, people need a little extra help. Call and let’s talk. Are you at the airport? A $20 Taxi ride to us from the airport could save you a wallet full of Airport Fees and Taxes, and we provide free transport back to the airport during normal business hours. However, if you make your own way to us we wont have to charge you a bunch of extra fees! Save up to 40% off Airport Rates! Reservations are prioritized on a first come first serve basis. Those reservations which are paid in full at time of reservation, receive the highest priority. Then those reservations which have some deposit are next, followed by those who have not paid at the time of reserving the vehicle. We will try to notify you by email or phone call, just as soon as possible, in the event of circumstances beyond our control such as damaged vehicles, breakdowns, delays, or customer failure to return.